and has a lot to offer in terms of sightseeing. 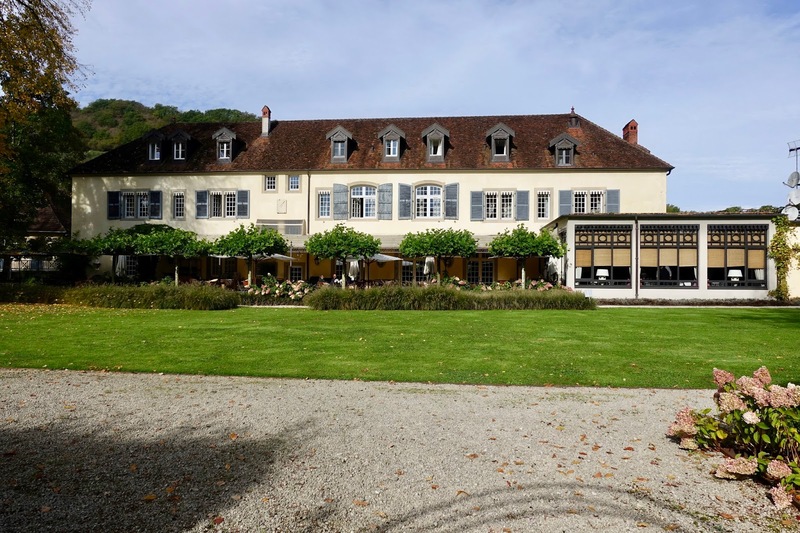 And best of all, the region is not that touristy as for example the nearby Burgundy and the Relais & Chateaux hotel with its two restaurants offers value for money. My husband and I spent a short stay here for the second time and it was even better than the first one. As I assume that you are not necessarily familiar with the regions in France, I give you the big picture. 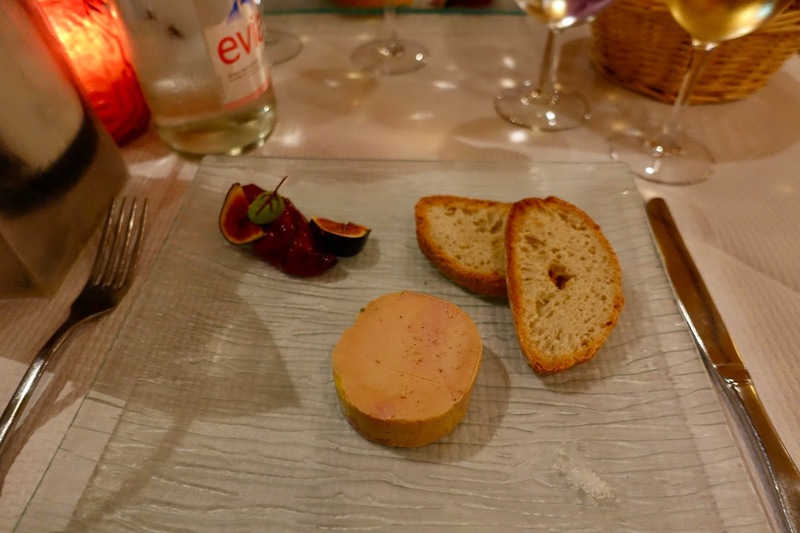 When you are heading to southwest from Paris, you pass the well-known Burgundy before coming to the French Jura, which is less known but not less worthwhile visiting, and as said above, there are fewer tourists and the price-performance ratio is much better. And imagine, it can be reached in about 2 ½ hours by TGV (high-speed train) from France’s capital. If you know the area a little bit, it is a 30-minute drive from Dole and Besancon. The estate was built in 1700 as a hunting lodge. The owner was Marquis de Germigney who used it for festive events. In 1830, it was converted in a hotel and ever since guests come here to enjoy the wonderful property with its stately park. Port-Lesney is an attractive, quiet village on the banks of the river Loue and close by there are two fascinating UNESCO rated historical sites (Royal Saltworks at Arc-et-Senans and Salt Mines at Salins-Les-Bains). As soon as you turn into the chateau’s courtyard, it feels like having gone back a few centuries. There is everything you expect from such a stately property plus contemporary comfort. The mansion was expertly furnished by two renowned interior designers, one of them is still the owner of the hotel. The period character of the house was maintained but without giving the impression of being outmoded. Eye-catchers are the sweeping staircase, the comfortable salon with a huge fireplace or the vaulted dining room. And it is such a nice thing to have a walk on the property’s extended grounds, each time catching sight of another interesting detail here. In short, it is the chateau of your dreams. 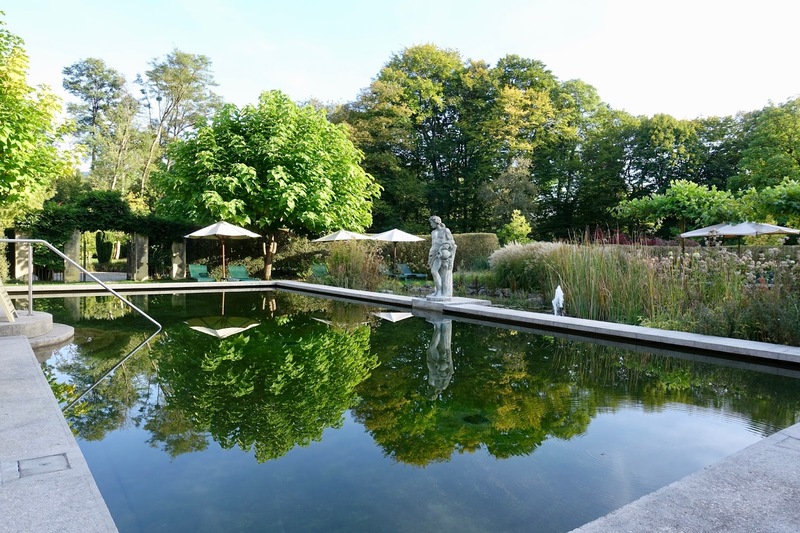 I start with the gardens, as I think this is the most enchanting feature of the property. Its size is impressive – more than 3 hectares – and you can always find a secluded place where you can indulge in serenity. 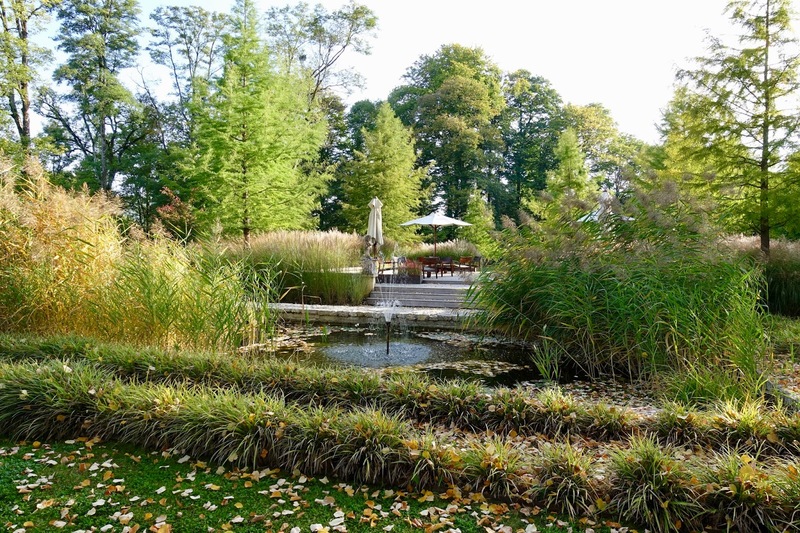 While one part is kept in the landscape garden style (English garden), the other one is more formal and symmetrical (French style). Maybe ten years ago, a natural water swimming pool was added. 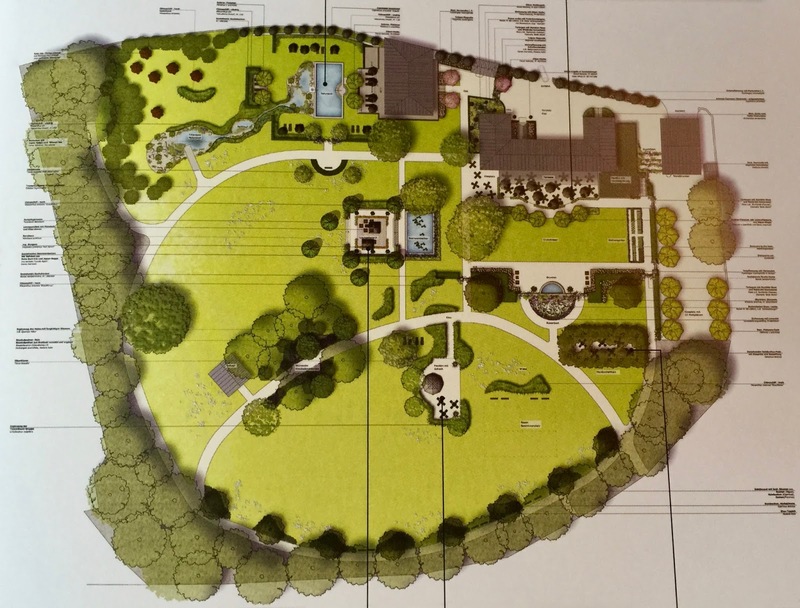 It is harmonically integrated in the surroundings and the swimming area together with its regeneration zone makes an attractive water garden environment. In the park, you further find an idyllic old arbor, some parlor games, a henhouse, an herb garden and of course many paths meandering the grounds. Apart from the two restaurants (see more details under food) there is also a wide terrace overlooking the park, a salon and a bar. The standard of service at Chateau de Germigney is high. The hospitality and the gracious attitude of everyone with whom we interacted – from the innkeepers to the chambermaids – were impressive. All the staff went above and beyond to make our stay perfect. 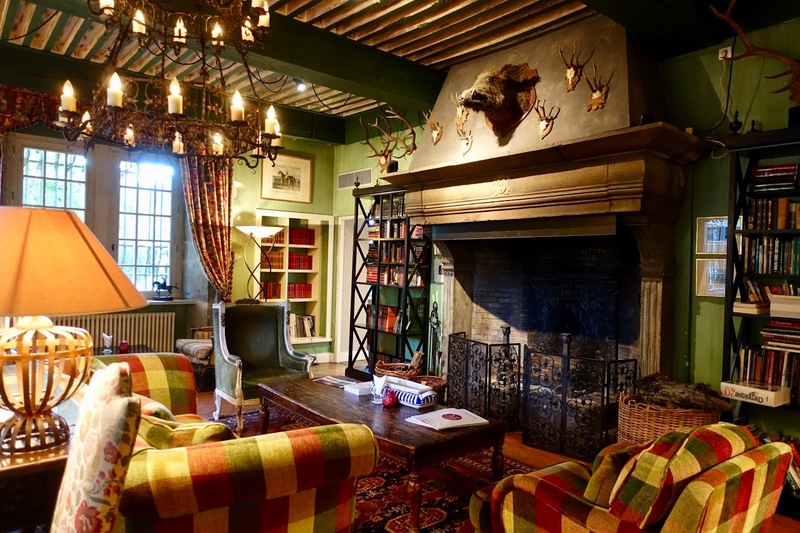 There are 17 rooms to choose from – but be well advised to book early. When be took our reservation well ahead, there was only one room left – a suite. 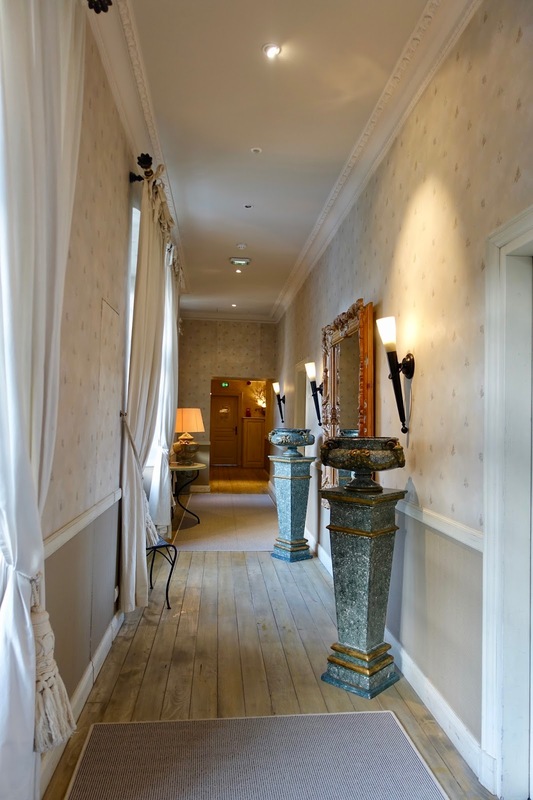 Each room is individually decorated in a classic style, with well-chosen fabrics, wooden floors and period furniture. Most rooms leading off a wide, airy corridor that runs the length of the house. Our suite was number 10 where a renowned French politician, Edgar Faure, used to reside at the time. There are two spacious rooms, elegantly furnished, with beautiful views of the park. The bathroom is large enough featuring double sinks, made look old-fashioned, but unfortunately only with a somewhat inconvenient shower-bathtub. This latter point is the only flaw I could make out, all the rest is just great. There are two dining venues at your disposal, both offering foodies’ delights, although on a different level. On the one hand there is Pierre Basso Moro’s Michelin-starred gourmet restaurant onsite. 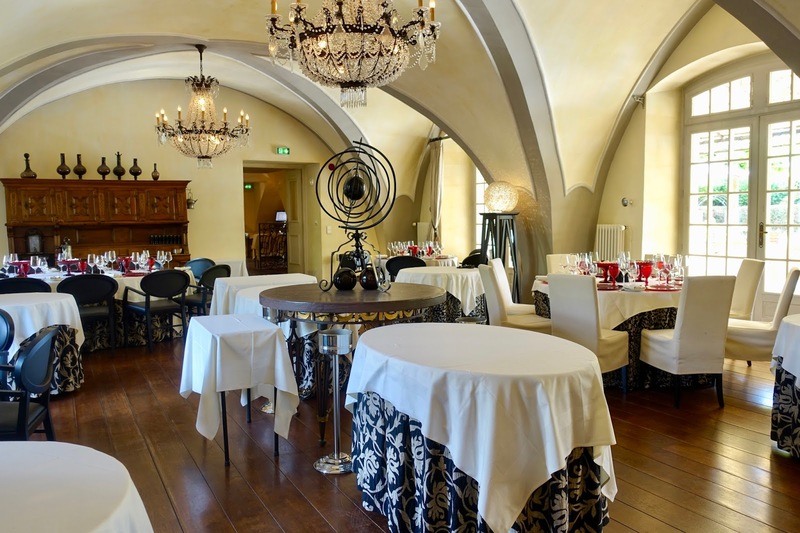 On the other hand you find here Bistro Le Pontarlier, which is located a 5 minutes’s stroll away in the heart of the village of Port-Lesney. the other one “Orangerie”, a contemporarily decorated former greenhouse. The chef, who has been in charge here for 20 years (! ), prepares refined dishes influenced by his Mediterranean roots and sourced from local produce. His cuisine is generous and subtle, the menus are well-composed. My husband and I dined here on the second night and chose the signature menu “Marquis”. Out of the 7 courses I liked following ones best. 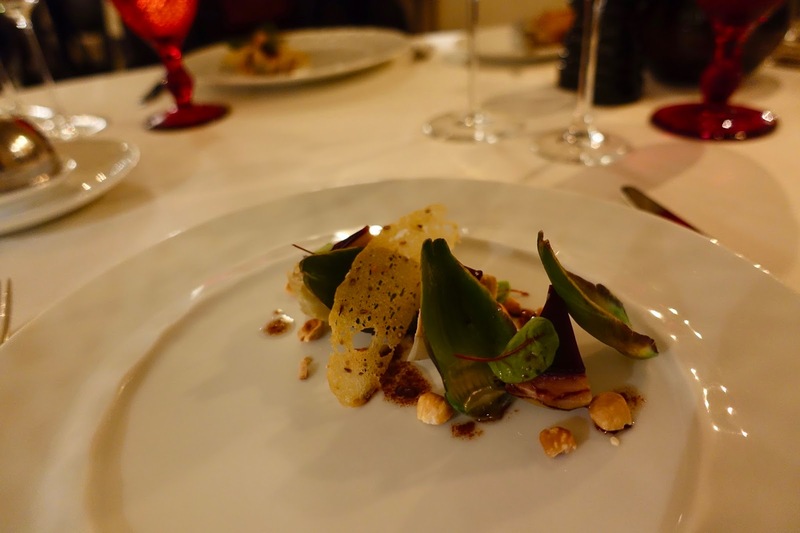 For one thing, I was enthusiastic about the first starter, foie gras cooked in an artichoke, which was an unusual but tasteful combination. 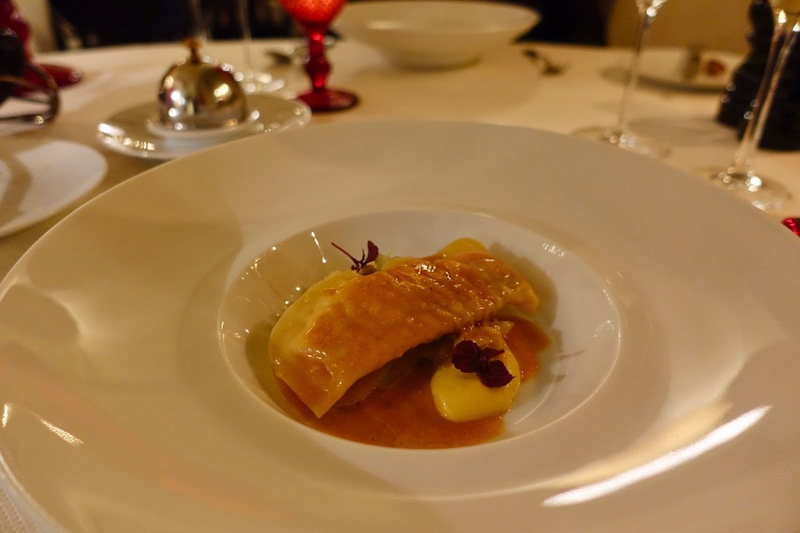 Apart from that, the third starter, red mullet cooked in a ravioli, blended just magnificently and was full of flavor. Other highlights were the excellent cheeseboard and the masterly composed fruit dessert, which is usually not my favorite kind of sweet course, but here it was outstanding. Pierre Masse Moro's creative cuisine is certainly worth a detour! 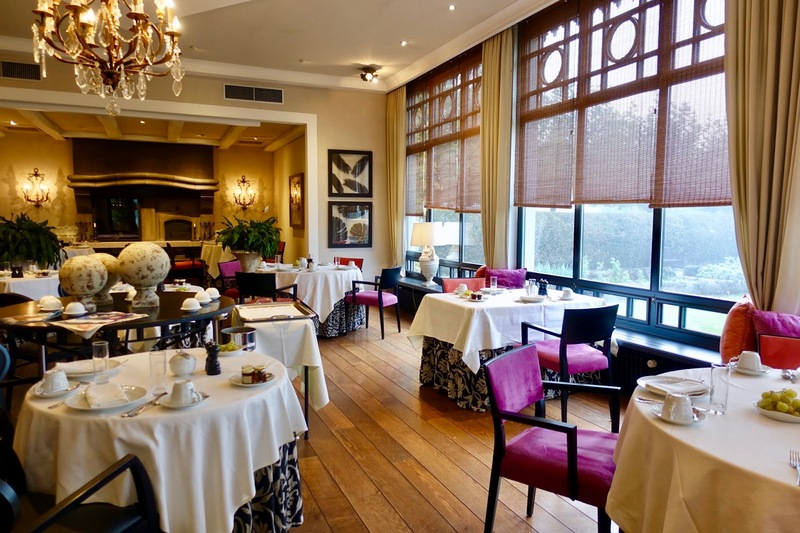 The Bistro Le Pontarlier, which is as mentioned an offsite place, offers a simple yet tasty cuisine. It is awarded a Michelin Bib Gourmand (for restaurants offering good food reasonably priced). 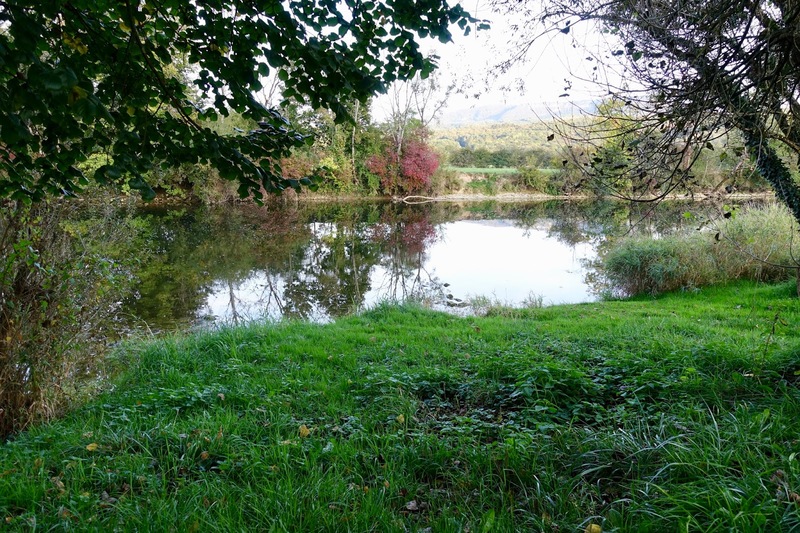 It is idyllically situated on the banks of the river Loue, rather large and boasts a spacious terrace. 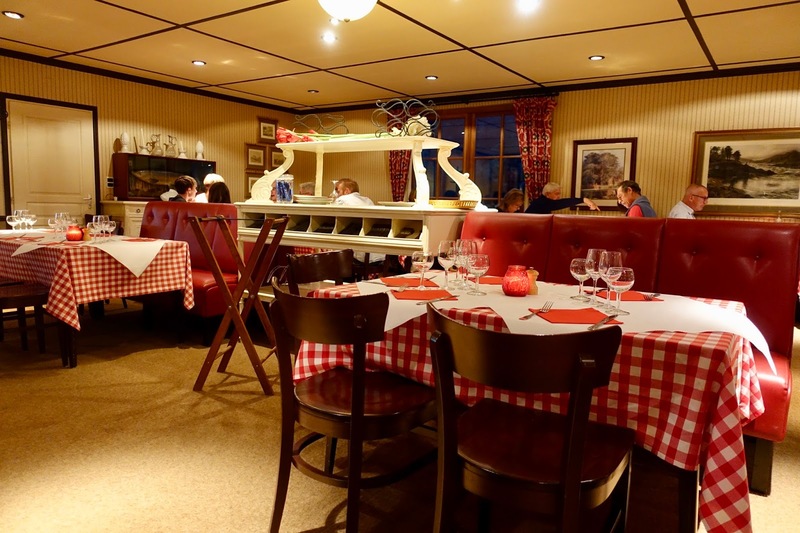 The bistro is decorated in a rather quaint style, with a lot of knick-knacks and chequered tablecloths. On the walls you find pictures showing hunting scenes and in some places stuffed fishes are showcased. The restaurant’s design is certainly not everyone’s cup of tea but here it suits in some way. Service is friendly and quick. 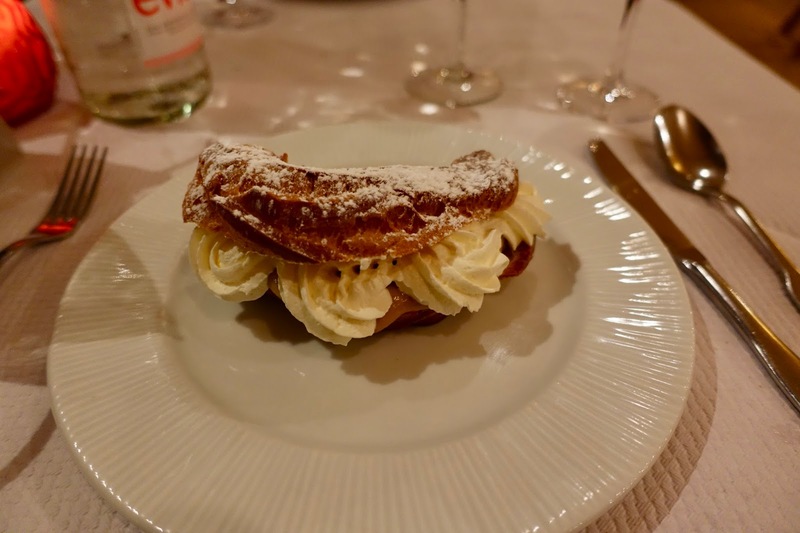 and the unrivalled Paris Brest, a dessert made of a ring of choux pastry filled with a praline flavored cream. Both dishes are veritable delicacies, although it is not exactly light fare! My recommendation is it to eat in both the restaurant and the bistro. I would suggest that you visit the bistro first and the gourmet restaurant afterwards. In such a way, you can benefit from an interesting contrast effect and heighten the sophistication factor. 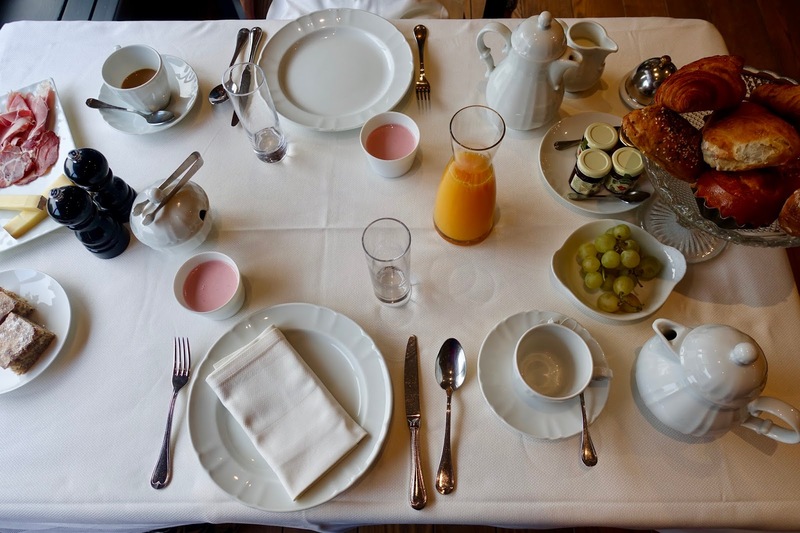 Breakfast at the Chateau de Germigney is not to be missed, it is a real French dream! There is a variety of bread, a pastry of the day, cheese and cold cuts, home made yoghurt/fromage blanc and an egg or omelet if you wished. Prices are fair considering the “whole package”. 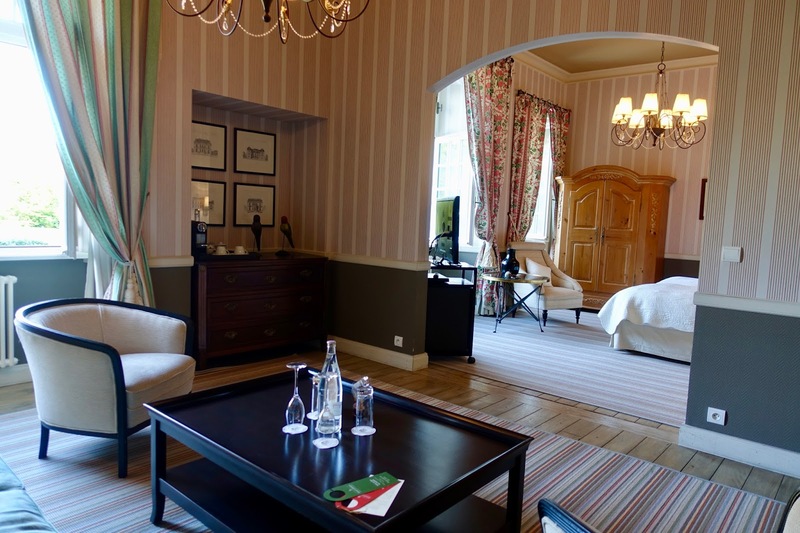 The suite costs 405 € per night plus 23 € for breakfast, the dinner at the bistro was a bargain (28 €) and the signature menu at the gourmet restaurant is available for 120 € (all rates per person except the suite). I think this is good value for money. In this respect it has to be taken in account that the hotel does not have all the facilities that a discerning traveler might need such as a spa or a fitness room. 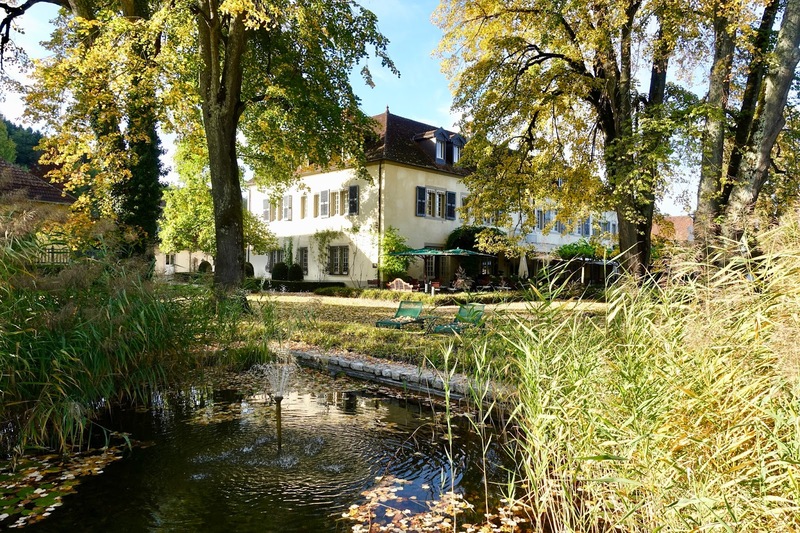 Chateau Germigney is the perfect spot for a short break in the eastern part of France. 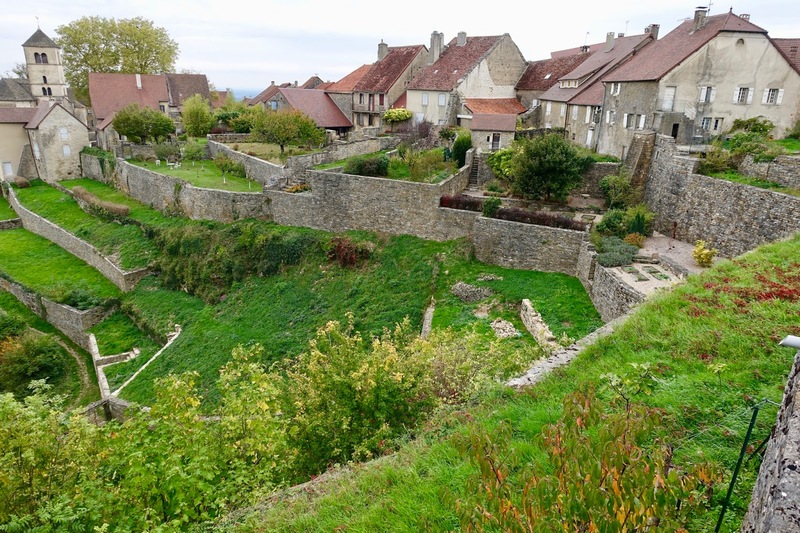 The French Jura, the region where it is located in the charming village of Port-Lesney, is beautiful and not overly touristy. 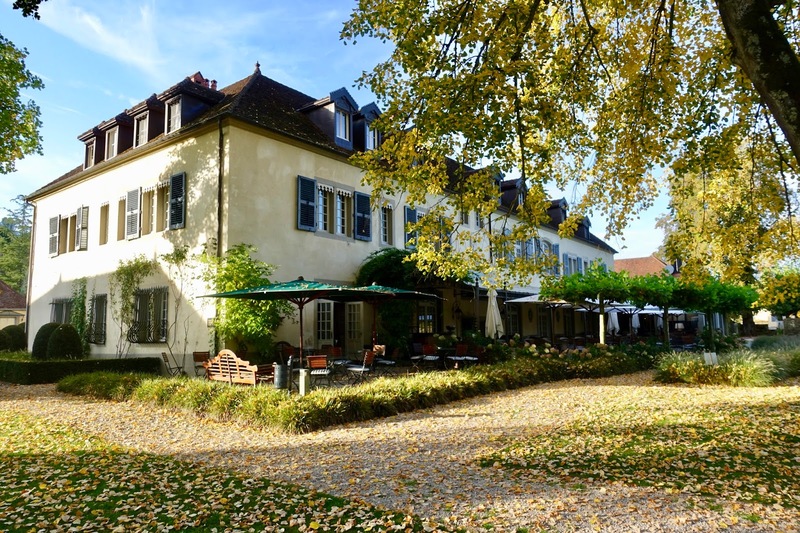 The overall experience here is just great: a peaceful setting, a lovely chateau, traditional country fare in the rural bistro, upscale dining in the gourmet restaurant and last but not least the gorgeous park!